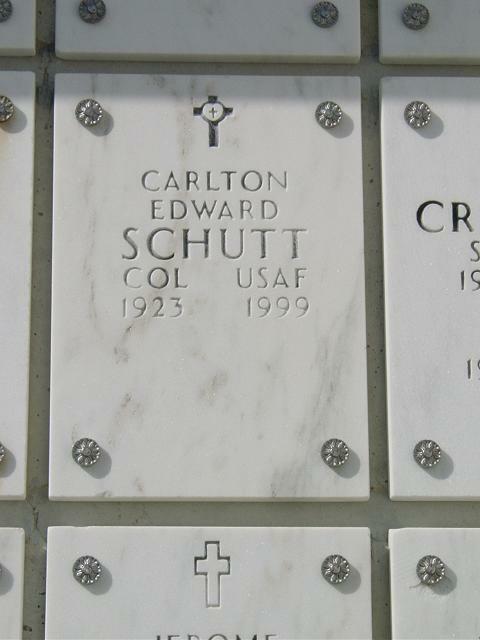 Carlton E. Schutt, 76, a colonel who retired from Air Force headquarters in 1973 as chief of the personnel research and analysis division, died of a heart attack July 26, 1999 at Inova Mount Vernon Hospital. He lived in Alexandria, Virginia. Colonel Schutt was a native of Buffalo and a graduate of Cornell University. He received a master's degree in education from the University of Buffalo. Colonel Schutt began his military service in 1940 with the Army Air Corps. He flew bombers in Europe and the Pacific during World War II. He served in Alaska during the Korean War and in Vietnam during the war there. He was also posted to Libya. After he left the Air Force, he was vice president of Orbital Systems and Waste Management. He also owned Carl's Exxon on Route 1 in southern Alexandria. His honors included a Legion of Merit, Meritorious Service Medal and an Air Medal. Colonel Schutt was a member of the Retired Officers and Air Force associations and a trustee of Nativity Lutheran Church in Alexandria. Survivors include his wife of 52 years, Doris L. Schutt of Alexandria; five children, Dr. David Schutt of Washington, Dr. Lynn Schutt and Carl Schutt, both of Alexandria, Air Force Colonel Paul Schutt of Scott Air Force Base, Ill., and Andrew Schutt of Macomb, Mich.; and seven grandchildren. On July 26, 1999, of Alexandria, VA, CARLTON E. SCHUTT, a retired Air Force Colonel who served in WWII as a B-24 and B-29 pilot, also served in Alaska, Libya and Vietnam. His other posts included Military Airlift Command at McGuire AFB, Scott AFB, and the Pentagon as Chief of the Research and Analysis, RCS Personnel. Colonel Schutt who was born in Buffalo, NY, was a graduate of Cornell University, Ithaca, NY and received a Masters Degree in Education from the University of Buffalo. He also attended the Squadron Officers School, Air Command and Staff School, the Armed Forces State College and the Naval War College. His military decorations include the Legion of Merit, the Meritorious Service Medal, the Air Medal and the AF Commendation Medal with two oak leaf clusters. He was a life member of the Retired Officers Association, the Air Force Association, and a former Trustee Emeritus of Nativity Lutheran Church, Alexandria, VA. Survivors include his wife of 52 years, Doris L.; five sons, Dr. David C., Dr. Lynn E., Col. Paul E., Carl W. and Andrew D., as well as seven grandchildren. A memorial service will be held at the Nativity Lutheran Church, 1300 Collingwood Rd., Alexandria, VA 22308 on Saturday, July 31 at 4:30 p.m. Interment will be held at Arlington National Cemetery with full honors on Thursday, August 12, 9 a.m. In lieu of flowers, contributions may be made to Nativity Lutheran Church Memorial Fund in memory of Colonel Carlton E. Schutt.